I have been away for a while, I am sorry for that. I just wanted to provide a quick update on what happened since I last posted on the blog. Last year, I went on a trip for a month to Cambodia, Thailand, Malaysia and Maldives. Below, I will leave with some photos that I took from my trip for your viewing and I will definitely post another blog detailing my adventure in the next few days. I hope you enjoy the photos and I will be back soon with more information. Stay tuned! I know that it has been a while since I last posted on my blog. I had a lot of things happen to me this year but I am doing great so far. I have some exciting news to share with you all. I will keep it real short till I update my blog next month in Phnom Penh with PEPY Tours but yeah, I will be travelling to four countries for six weeks. I will be starting my journey in Cambodia, then I will be going to Thailand, Malaysia and then, the Maldives. I am really excited for this trip and I can't believe that it is going to happen. I hope to have an amazing experience and I really can't wait. I will post up more information next month, till then, wish me luck!!!! I have wanted to go to Malaysia for a while now. As luck would have it, I got the opportunity to travel on a two week journey to Malaysia in September 2014 with close friends. I think what piqued my interest in starting a journey to the country was the amazing cultural diversity, represented by the unity of the Indian, Malay and Chinese communities. I was enchanted with the vibrancy of nightlife in Kuala Lumpur, including the mamak stalls (which I came to love) and the friendly faces that drew me to starting easy conversations. I remember a short visit to Hussein cafe, a few minutes walk from KL sentral, where I befriended the local chef who made an amazing roti omelette. Honestly, it was the most amazing roti that I ever had and till this day, I dream about it. I know it seems ridiculous to think about food in this way, but trust me, my taste buds don't lie. I kept saying "terima kasih" to the roti chef, whenever I wanted some roti canai and I could always see that he smiled when I said that. I guess it was worth it, I always love to thank people for the service and I am happy that I always left the place with a good impression and with some amazing roti to boot. Our brief visit to Kuala Lumpur ended with a magnificent view of the Petronas towers at night. The towers looked unreal and I remember that night where the low lying clouds and the lighting of the towers, evoked this eerie and mysterious vibe. Seriously, I have to admit, Kuala Lumpur would make for a fantastic Gotham city. I will definitely come back with friends to the city next year for further exploration, after my trip to Phnom Penh for my university immersion experience with PEPY tours. The trip to the east coast of Malaysia has given me a dose of the island getaway, so I was looking to experience it. 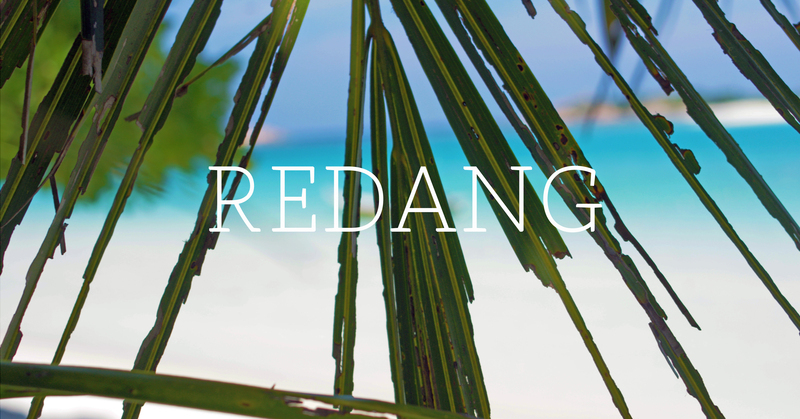 I have always dreamed of a tropical paradise and I believed that Redang was the ideal island for a nice retreat. Even though, I knew where I was, I never thought I would see this pristine looking beach with incredibly clear waters, powdery white sands, coconut palm fringed trees and a breathtaking natural backdrop jumping out at me. I have to admit, the highlight of the resort that we stayed in the island was the beach. It was incredible, as I swam in the most beautiful warm waters that I have ever seen in my life. When I got out of the water, I found shade from the coconut trees, where I felt a relief from the sweltering Malaysian sun. After a swimming break, I walked past the resort to reach the end of the beach at Teluk Kalong Kecil, where I took photos from my Sony phone and the Pentax k-x. When I contemplated to myself that I finally found somewhere that I thought was unmistakably a heaven on earth, I felt like truly letting my thoughts escape from everything. For that moment, I was lost for thoughts but I don't want to take away from the experience and highlight that, this was all I got from the trip. We went to a private beach resort named Wisana in Teluk Kalong Kecil at Redang island. Before we got there, I made sure that the reservation was confirmed. We hired a taxi driver and we really appreciated everything that he did, from picking us up from Kuala Terengganu airport to the jetty port to a return trip to the airport after our island trip. After a full day trip from Sydney to Kuala Lumpur with our Airasia flight and a night stay in Kuala Terengganu, we got to Wisana the next day by noon. The journey was long but it was worth the wait. After a one hour taxi drive and a two hour ferry ride, we reached the beach resort where we got to stay there for 4 days. I have to admit, Wisana was the perfect place for us, as we truly got to stay in a place that allowed us to feel completely at ease with the environment. The chalets that we stayed in had an incredible view of the beach and the main advantage of the resort was its secluded location where it is quietly tucked away in a beautiful surrounding forest and greenery. In addition, we liked that the staff were really helpful and they made our stay quite special. I remember one night, we had a nice dinner facing the beach and the staff members made a beautiful set menu with a touch of a traditional Malay homestay experience. Also, one of the staff members in the early mornings of our stay at Wisana taught me some Malay and I loved it. We have had such great memories of our stay in Wisana and we will never forget such an experience. It really felt like we were living in a second home. If you are looking for an island experience with a secluded vibe, I would definitely recommend Wisana at Pulau Redang. So where does this leave me? Well, I did have a great time in Malaysia, I have met friendly people and maintained some contacts, but I want to come back and explore more of it. Hopefully, the next trip back will be sooner rather than later. I hope you enjoy the read!!! My name is Adam. I am a university student, living in Australia and I love travelling. I suppose that is what drove me to writing this blog. I think of travel, perhaps with an understanding that it is not only about personal exploration or liberation, but rather one of seeking connections with the people. I have been to a few countries, but my lifelong plan is to travel around the world. I wish that my journey will lead me to become a part of something, whether it is through understanding different cultures, values and most of all, the lived experiences of the people. I will keep this short, but I hope that my future trips will leave you with a sense of inspiration and be a catalyst towards an adventure that you might seek in the future. I hope you enjoy my blog and trust me, this will only be the start of a crazy world exploration. Today is a new day. Tomorrow is a new life. Adventure is just around the corner. Enjoy the read!! !